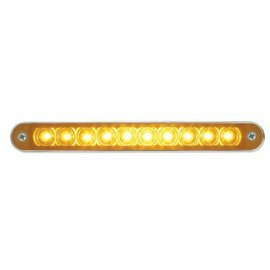 6 1/2" 10 LED Flush Mount Light Bar. Red LED w/ Red Lens. 6 1/2" 10 LED Flush Mount Light Bar. Red LED w/ Red Lens. 3 Wires hookup. Dual Function. Mounting Holes Approximately 6" Apart. Sold Individually, No Warranty.